Valves heteropolar and linear. Headpole is capitate and ends bluntly truncated, 3.1 to 3.7 µm wide. Foot pole is rostrate, ending rounded, 1.3 to 1.6 µm wide, not as wide as the valve center. Rimoportulae present in the headpole. Striae very fine, not easily resolved in LM. Spines can be faint in LM, occurring at the valve margin 6 to 7 in 10 µm. In girdle view, the head pole is expanded in the pervalvar axis. 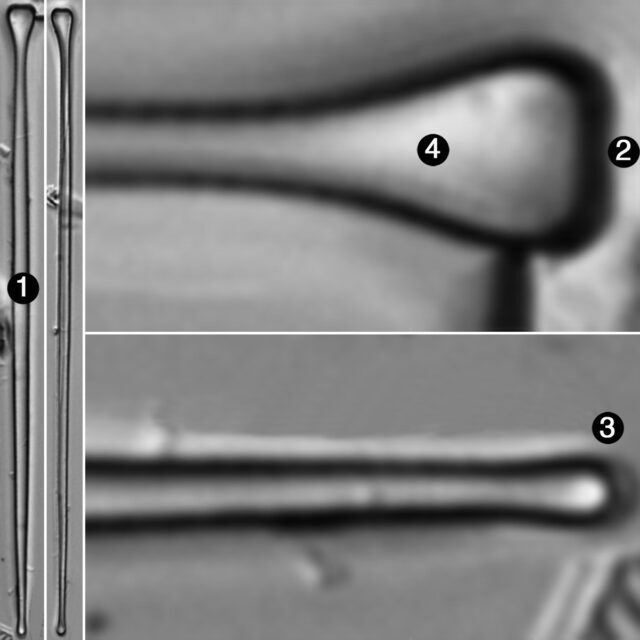 This taxon is commonly found in the plankton forming stellate colonies in northern, low pH lakes and ponds of the northeastern United States (Körner 1970, Camburn and Charles 2000, Siver et al. 2005) and Canada (Fallu et al. 2000). Here we observed A. ralfsii var. americana from Partridge Lake in the Boundary Waters Canoe Area Wilderness of northern Minnesota. 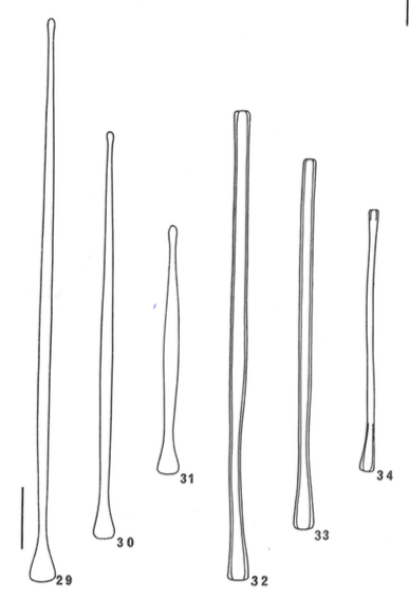 It differs from the nominate variety and the other variety by the triangular shaped foot pole, the smaller transapical width in the middle of the valve and by the distinct geographical distribution; besides to be distinguished by means of the electronic microscope by the broad pseudoraphe. Valves heteropolar and very narrow. Headpole capitate ending truncate, foot pole rostrate ending rounded and more narrow than the valve center. Rimoportulae visible at the headpole. Spines present along the valve margin.